Also tonight, the senate has now confirmed president trump’s nominee for attorney general. He will now oversee the Mueller investigation, and how much of any final report is actually seen by the American people. William Barr was approved largely along party lines. During his confirmation, he did not commit to releasing Robert Mueller’s full report to the public. The news comes tonight as we hear a new account from former FBI deputy director Andrew Mccabe about the president and what Mccabe says he did to protect the Russia investigation. The president is firing back tonight, and here’s chief justice correspondent Pierre Thomas now. Reporter: Tonight, for the first time, former acting FBI director Andrew Mccabe opening up about why he launched a counterintelligence investigation in the president of the United States. In his new book, Mccabe writes president trump phoned him just hours after firing James Comey. “It’s don trump calling,” he said. “People are really happy about the fact that the director’s gone. 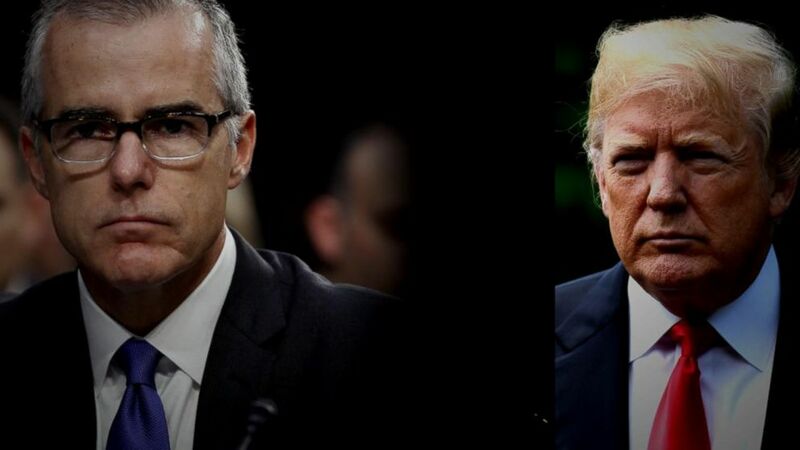 Are you seeing that, too?” Mccabe says he didn’t want to tell the president the opposite was true, that “You could go to any floor and you would see small groups gathering in hallways, some people even crying.” He tells “60 minutes” that the next day, he was summoned to the oval office. I was speaking to the man who had just run for the presidency, and won the election for the presidency, and who might have done so with the aid of the government of Russia. Our most formidable adversary on the world stage. And that was something that troubled me greatly. Reporter: Mccabe launched an investigation the very next day, to determine whether the president was as a Russian agent and was obstructing justice. I was very concerned that I was able to put the Russia case on absolutely solid ground in an indelible fashion, that, were I removed quickly or reassigned or fired, that the case could not be closed or vanish in the night without a trace. Reporter: More cake was fired, accused of leaking to a reporter and then misleading investigators about it. Prosecutors are weighing if he should be charged. Today in a withering tweet, president trump called him “A disgrace to the FBI and a disgrace to our country.” So, let’s get back to Pierre live, because the new attorney general, William Barr, confirmed today, and he would not commit to releasing Robert Mueller’s full report, Pierre. Reporter: That’s right, David. He said he wants to be transparent, but at the end of the day, Barr says he’s going to rely on justice department guidelines to determine how much we all get to see. David? Pierre Thomas with us live tonight. Pierre, thank you.